Neighbourhood Travel Desk: The Baba Reshi shrine Located in Baramullah district. The shrine is highly revered by Muslims and Hindus. A fireplace was constructed by the saint in the village, which is believed to fulfil the wishes of people. The shrine of Baba Reshi has become a popular Gulmarg tourist spot to visit and is thronged by visitors throughout the year. 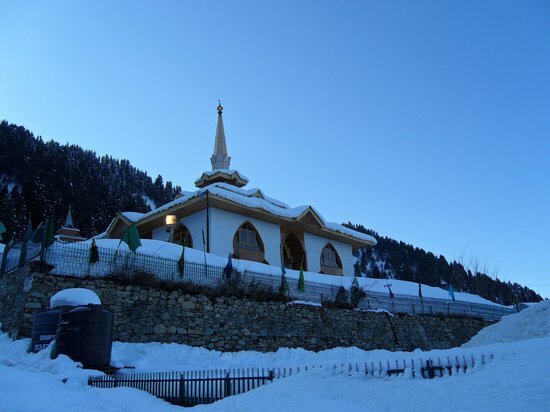 Jammu & Kashmir tourism department also recognizes this holy shrine as a vital attraction of the valley. This 500-year-old shrine was constructed with the architectural style of that time and it was dominated by Persian and Mughal influences. Inside the tomb are beautifully-crafted wooden artworks reminiscent of the bygone era. The tomb can accommodate more than a 1000 devotees at any given time. Surrounded by lush green lawns, this shrine attracts hordes of visitors both for its religious and historic significance. It is also believed that childless couples are blessed with one after praying here. It is a must visit on the itinerary of every visitor to Gulmarg.